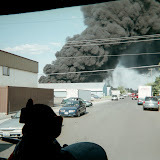 NARRATIVE: On 11/02/07 at 7:51 A.M. the Spokane Fire Department responded 18 firefighters on 3 engine companies, 1 ladder company, 1 pumper ladder company, 1 rescue unit and 2 battalion chiefs to 3928 N. Elm on a report of a structure fire. First in crews found a basement fire in progress. After stretching hose lines and ventilating windows, crews were able to search the entire dwelling and knock down the fire after approximately 15 minutes. There was one occupant present at the time of the fire and he made his way to safety on his own. Apparently, this occupant was sleeping when he heard the sound of something "breaking". This sound woke him and he then made his exit out of the house. The breaking sound turned out to be a glass aquarium that was in the basement. The glass became heated due to the close proximity of the fire and then shattered. After the fire was extinguished, it was found that there weren't any smoke detectors present. The public should be reminded that the fire department recommends a smoke detector on every level of the home outside sleeping areas including one inside each bedroom as well. Soon, we will be changing our clocks 1 hour back to standard time. This is also an excellent time to also check the condition of your smoke detectors. Please make sure they have fresh batteries and are in good working order. There were no injuries reported at this fire, however there were numerous tropical fish that perished because of the aquarium breaking and the heat of the fire. The Red Cross is assisting the family with lodging, clothing and food. The cause of this fire was found to be an overloaded circuit. The aquarium lighting system, pump and other accessories were found to be plugged into an electrical power strip along with other items plugged into this same strip. This exceeded the rated amperage of the circuit which caused excessive heat and ignited nearby combustibles. Damage to the basement was extensive and consisted of heat, water and smoke damage. The first floor above sustained heavy smoke damage as well. When using appliances, make sure of the circuit amperage ratings and never exceed them. If you would like more information on this incident please call the battalion chief office at 509-625-7020 or the investigation division at 509-625-7052 or 509-625-7053. PROBABLE CAUSE: Overloaded electrical circuit. Nearby combustibles. DAMAGE EXTENT: Extensive heat, smoke and water damage to the basement. Heavy smoke damage to the main level. There was also significant damage to furnishings and clothing. NARRATIVE: On Wednesday, 10/31/07, at approximately 0149 hrs units of the City of Spokane Fire Department responded to 2024. E Sharp upon report of a structure fire. First arriving SFD units found light smoke coming from the front door of a one story, wood-frame, single- family residence. Firefighters advanced a pre-connected hose-line in the front door of the home and found a rapidly advancing fire in the kitchen. While hose-lines were advanced into the structure, other SFD crew members laddered the roof in case ventilation was needed, checked the residence for any other fire areas, and checked the attic to assure the fire had not extended to that area. First arriving crews also determined that all occupants of the home had escaped safely. The main body of fire was eventually confined to the kitchen area. The fire was knocked down within 10 minutes with overhaul of the fire area continuing for another 45 minutes. The Red Cross was requested to the scene to work with the occupants of the home as they will be displaced for at least the night. Fire crews remained on scene for approximately two hours. A total of 24 firefighters on 9 trucks battled this blaze. No injuries were reported to either firefighters or civilians. PROBABLE CAUSE: The cause of this kitchen fire was a pan catching on fire on the stove top. One of the tenants had put a pan with oil in it on the stove and it eventually ignited. The fire then spread from the pan to surrounding cup-boards and wall surfaces. DAMAGE EXTENT: Damage to the home included fire and heat damage to the kitchen and nearby eating area, as well as smoke damage to the rest of the home. Some water damage was also evident. Total dollar loss is approximately $10,000. NARRATIVE: This morning, October 31, 2007 the Spokane Fire Department responded at approximately 3:32 AM to 1417 West Cleveland. The first crew on-scene reported smoke coming from the eaves of a 2-story, wood framed residence with fire showing from a second floor bedroom. Fire fighters aggressively attacked the fire from the interior of the structure while additional fire crews completed search and rescue, roof ventilation and salvage and overhaul. The fire was brought under control within 20 minutes. There were no reported injuries to civilians or firefighters. 9 fire companies with 28 firefighters responded to this fire and were on scene for approximately 2.5 hours. The occupants of the residence were alerted to the fire by their smoke detectors and were able to exit the structure safely. DAMAGE EXTENT: Fire damage was confined to the second floor with heat and smoke damage to a hallway leading to the upstairs. I just checked with the Washington Public Disclosure Commission this morning. I went over this twice and couldn't find anything listed for consultation or management, so I leave that to you to search. It doesn't take a genius to see that Mary makes her own "tough decisions" and Dennis Hession has someone else make his "tough decisions." P.S. This doesn't count what Dennis Hession spent on consultants to make the spin or "tough decisions": on firing Jack Lynch & explaining the boondoggle know as the Matrix Study. If you've seen the Dennis Hession TV attack ad - "Mary Verner's a Puzzle," you probably are asking yourself these questions - "Did Hession really hire an Olympia PR firm to come up with these lame ads? What did he do with the rest of the money Avista gave him?" Not only are these ads poorly done, there is nothing imaginative about them. Just the same old precanned attack stuff that any ad agency has sitting on the shelf. Only they forgot that after you attack your opponent you're supposed to tell why you are the better alternative. Well maybe they didn't forget. Maybe they just didn't have anything to say. Dennis, not only have these ads backfired on you - you wasted Avista's money! But, it is fun to see someone turn the attack ad on its head and come up with this positive ad I'm featuring in this post. It must have been fun to take Hession's gift of the "Mary Verner's a Puzzle" commercial and come up with this. You probably won't see this on TV because Mary doesn't have that kinda cash. Dennis had to borrow money to get his on the air and Mary is a little more fiscally conservative than him, I guess. Anyway, enjoy!